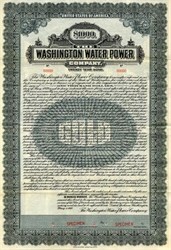 Beautifully engraved Specimen Gold Bond Certificate from the Washington Water Power issued in 1919. This historic document was printed by American Bank Note Company and has an ornate border around it with a vignette of the company's name. This item is over 86 years old and has 40 coupons attached. Washington Water Power Company built the Monroe Street Dam on the Spokane River in downtown Spokane in 1896, just 15 years after the city of Spokane Falls was platted and seven years after fire destroyed 32 blocks of the downtown business district. In Spokane, as elsewhere in the Northwest, hydroelectric power and progress were linked. Within a year the output of the little Spokane Falls plant was insufficient. In 1888 a new plant was built that had four times the capacity of the old one. The boost in power enabled the company to offer twenty-four-hour service, extend lines to residences for the first time, and to power the first electric motors, including some for the presses of the Spokane Chronicle. But when the company failed to secure the eastern capital needed to expand its facilities, the Edison-affiliate succumbed to the Washington Water Power Company, organized by local businessmen in 1889. Edison and his investors were convinced that water power had no future, but the Spokane entrepreneurs gazed knowingly at the spray of the lower falls and dared the opposite. The eastern steam technology and Edison-patented equipment were not indispensable, they believed, in a town built around and named after a powerful river falls. An article in Electrical World the next year revealed the debt Spokane Falls owed to the development of its hydroelectric power: "The remarkable electrical developments in the far west are nowhere more strikingly exhibited than at Spokane Falls. The rapid and phenomenal growth of this city finds its parallel in the growth of its electrical industries, and this is undoubtedly due in great measure to the magnificent water power that the city posseses." Washington Water Power and president Rockwood Moore was a Spokaneboomer-president of the First National Bank and of the lucky Last Chance Mine, organizer of two electric street railways, and one of the most extensive property owners in town. Moore and the company�s other Spokane investors had good reason to be optimistic about their venture. Even after a fire wiped out the thirty-two-block business district in august 1889, the city of nearly 20,000 began rebuilding immediately and kept on growing. The demand for power increased so quickly that the company could not install new dynamos fast enough. By the early 1890s a half-dozen railroads and several electric streetcar systems ran their tracks through Spokane. The biggest of the railroads, the Northern Pacific, ran an aggressive Midwestern campaign touting the great agricultural potential of its land-grant tracts in eastern Washington. When nature cooperated in this promotion with above average rainfall from 1893-97, the railroad was rewarded with trainloads of immigrating families. That Spokane had developed into the �Heart of the Inland Empire� was precipitated by its railroads, but predisposed by its falls. The electric company�s decision to situate a large central station at the lowest falls on the south side of the river, "Where the stations could be enlarged to meet the demands of a city of 100,000 people," was propitious. The original Monroe Street dam and the power project began operation in November 1890. Its six Edison generators produced DC current with a capacity of 890 kw, of which a littler over one-third was used to operate the streetcar system. IN 1892 the station was expanded to 1,439 kw, of which a little over one-third was used to operate the streetcar system. In 1892 the station was expanded to 1,439 kw, which included a 60-kw AC generator. Eleven years later the facility was rebuild and some of the DC works were replaced with AC equipment. Two of the 1903 generators, which are still in use, are to be the oldest operating electrical equipment in the state. Washington Water Power grew slowly in its first four years and then nearly went under when the financial panic of 1893 swept the nation. But by the turn of the century the company had recovered and during the next thirty years it bought out approximately eighty-five existing small-town systems and brought first-time service to twenty-eight communities. A second and third hydroelectric project, Post Falls and Little Falls both on the Spokane River, were completed by 1920, by which time Spokane number 104,400 residents. The Long Lake plant and dam, which went into operation in 1915, was the company�s largest and most difficult undertaking to date. At the time it was completed, the project boasted the world�s largest turbines and the highest spillway at 170 feet. In 1962, after the completion of several more hydroelectric projects on rivers in Washington, Idaho, and Montana, Washington Water Power was one of the few investor-owned utilities in the nation that generated all of its electrical power through the use of falling water.